The card ratings are mostly created in a vacuum and for Standard Format exclusively. Some cards are much better in Trilogy or Infinite Format, and notes are sometimes made of this, but the set is reviewed from the point of view of Standard Format play. It is always going to be difficult to adequately rate a card, and all the ratings are obviously going to be subjective, although we have tried to proximate an objective rating. The rating system is 0-5, with 0 being absolutely useless, 1 being the rating of a card that will rarely see play and 5 a card that will become a staple in many decks and will most likely feature heavily in competitive play. There are links to all the other parts of the set review at the end of this article! Red Heroes (and Villains for that matter) has direly been in need of some love ... the last many sets have not been good for red decks, and while this set does not seem to fulfill the ambitions of playing a competitive monored deck, it does offer some pretty good cards! 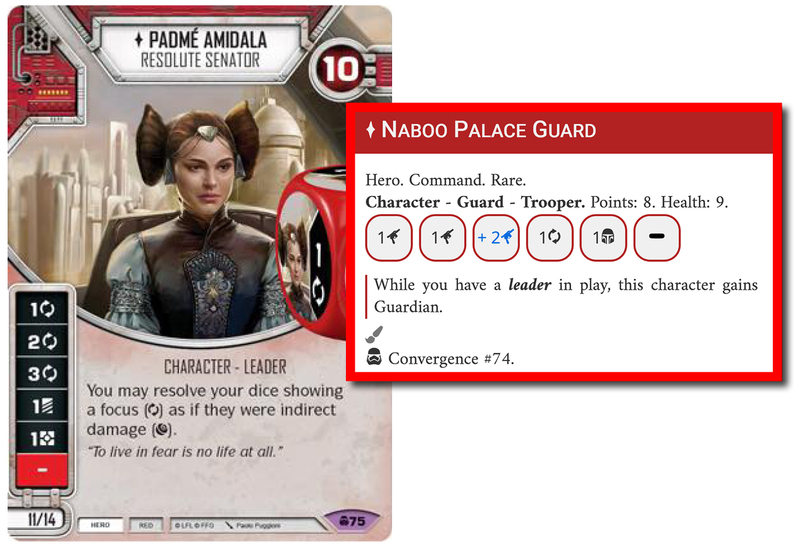 And includes, arguably the best Legendary of the set: Padmé Amidala! 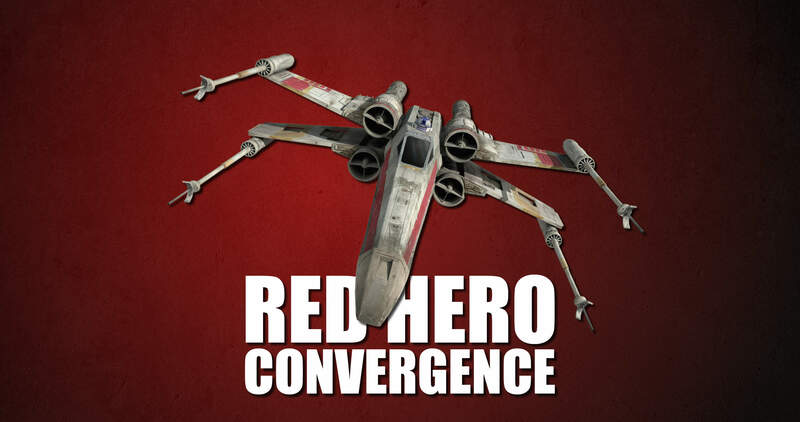 Trooper decks also look viable, although still unproven in a competitive environment, and if FFG follow the design path of this set, we might in the foreseeable future get our first monored deck (since the days of "It's a Trap" decks) that can fight it out with the big guns at the very top of the meta. I like this version of K-2SO much more than the old one (and thank goodness for that…). He is hard to evaluate though. He has solid stats - 11 health and a decent die for his cost (the pay side is unfortunate, but at least it’s a 3). His Power Action adds nice value, but isn’t amazing. His ability to end the action phase won’t come into play in most games, but is potentially game changing if the timing is right (especially against Indirect decks). So he has a lot of solid characteristics, but nothing amazing. What will that add up to? Will he end up being a mediocre character, or will the sum of the parts add up to something more? I’m not sure, but he’s not the binder fodder his previous version was. Another character who is difficult to evaluate. His die is interesting, but not amazing for a 16 point character, and neither is his health. His Action has a lot of potential (and makes that 2 Focus particularly juicy), but there aren’t many pairings with which he can really take advantage of it. Rex is really the only one that comes to mind. But maybe eRex/eKes can be good? With cards like First Aid, Measure for Measure, and Riot Shield, a mono red Trooper deck actually sounds appealing. I love Padmé. Her die is baller (3 Focus! ), and her ability makes her Focus sides particularly menacing. 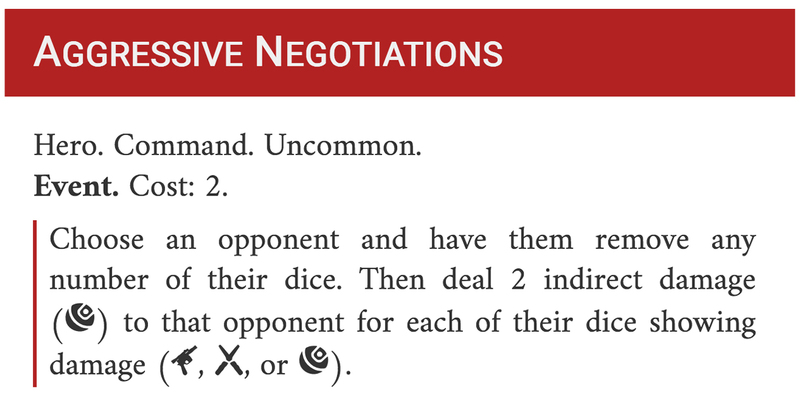 The opponent won’t know exactly what to expect when her dice are out there on Focus sides, especially with cards like Impulsive and Seize the Day available. That flexibility is what will really make her terrifying to sit across from, and gives her value in different kinds of decks. Also, just a reminder that Target Acquired is a card. I don’t think she’s quite a Yoda or Snoke level 5/5, but I think someone like Cassian is a fair comparison. A pretty solid non-unique. Three damage sides (no pay sides), a nice little Focus side, and 9 health. A useful ability as well. The only thing keeping this character from a 4/5 is the lack of a resource side. Even still, I expect the Palace Guard to fulfill a similar role to the one Hired Gun filled - a quality, high health non-unique to throw in 3-wide decks. It’s also important to note that he is a Trooper, which is a significant boost with all the quality trooper support that has been introduced in Convergence. I mean, this card seems busted in decks that can through out a lot of Indirect damage. 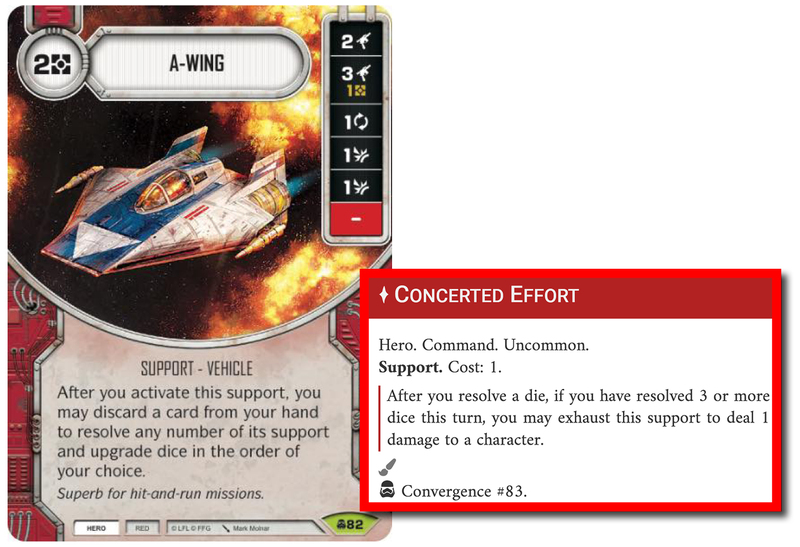 Thank the Lord that this card is Hero, so that we won’t see this card in Tarkin or Aphra decks. Even still, this makes potential Padmé decks even more menacing, and I wouldn’t be surprised if this card pops up in Shadow Caster decks. 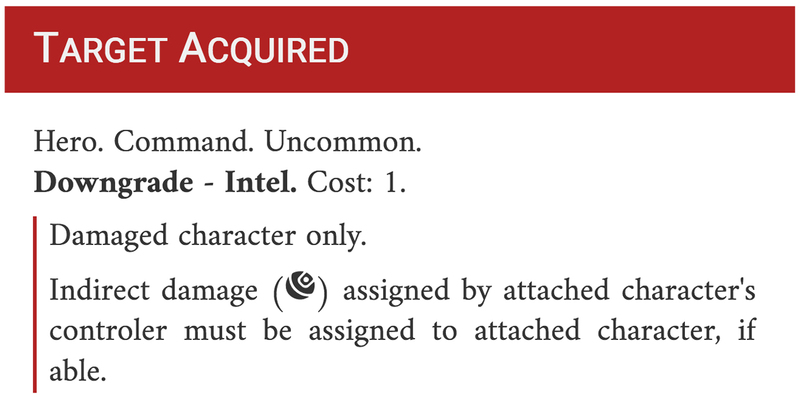 It’s important to mention here that a character does need to be damaged before Target Acquired can be put on them - so an opponent can try to avoid an early Target Acquired on their primary character. This is one of those 2 cost removal cards that has high upside, but doesn’t always do what you want it to do. It just won’t save your characters in critical situations, and I can’t give a high grade to a 2 cost removal card that can’t save your characters when you need it to. I will say that the ideal situation for this card is an end game 1 on 1 situation, in which your opponent doesn’t have the health available to take the Indirect. So maybe this is okay in a middle/middle meta? Not much to say, just a solid piece of 1 cost defense. You never really feel bad about having this card in your deck. There are situations in which this card is very good - for example, if you have 1 health left on a small character. But most of the time it’s just too big of a price to pay. It will be dead much of the game, and that’s why I can’t give this card any higher than a 2/5. This card is okay value if used on a 3 side, and does give you nice reach capabilities. So it’s not terrible. If it didn’t have a cap it could have incredible upside in Shadow Caster decks, but as is I don’t see this card seeing much play. 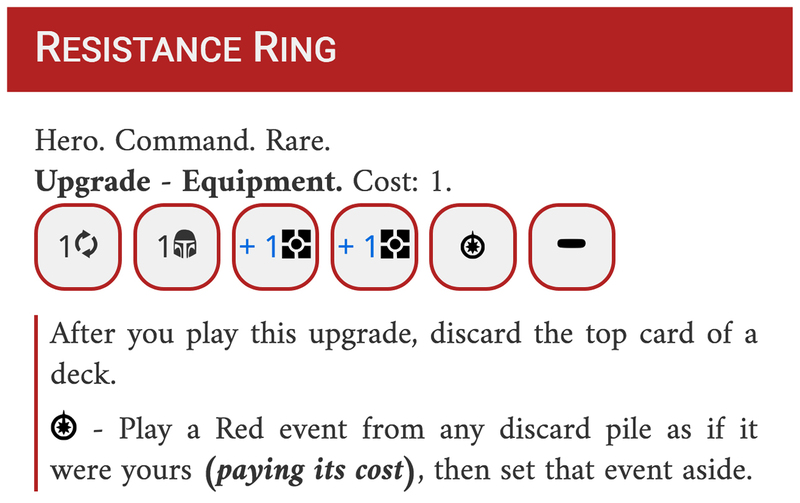 A large reason why readying a character is so powerful is that you get to use Upgrade dice again as well. The stipulation that this has to be a naked character makes this card much worse. There are a few Red characters this could be valuable with (Padmé and Jyn Erso maybe? ), but I don’t see this card adding enough value to actually see play. I don’t love the die on this card, but the ability is spicy. I don’t really think you want to invest a lot of mods in this card, which is where the ability could really shine, as I expect to see Vandalize all over the place post rotation. But the ability can be valuable just on this die alone, especially late in the game. A solid 2 cost support. This card is boom or bust. 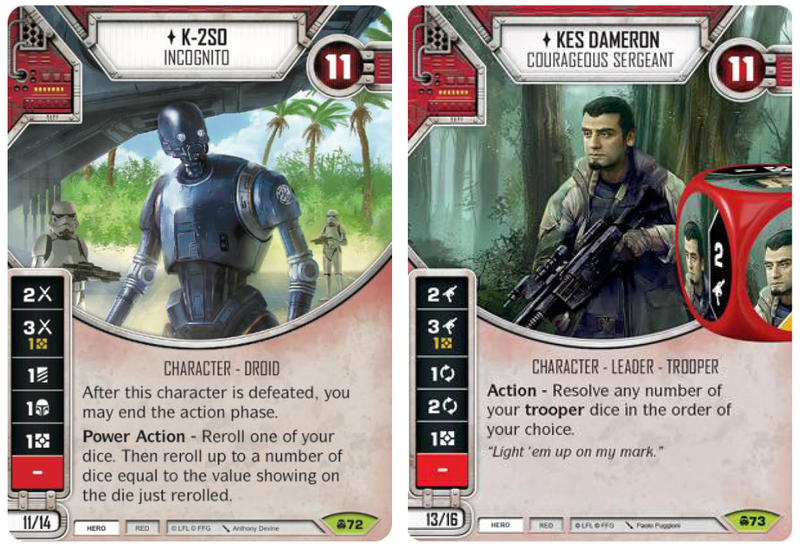 It is not a card that you will play in any sort of vehicle deck, as you have to have trooper dice for it to be good. But it also has the potential to be broken good. Special, Special, Special, Special… You get the idea. I will not be surprised if there’s a trooper LAAT deck that manages to make some noise in the competitive scene. Clone Trooper/eCody/eSatine is a possibility that comes to mind. *An infinite loop with Kes Dameron and LAAT has been discovered. Expect this card to see an early errata, which may change my opinion of it. I gave this card two ratings, because it’s value is so much higher if it’s paired with Padmé. 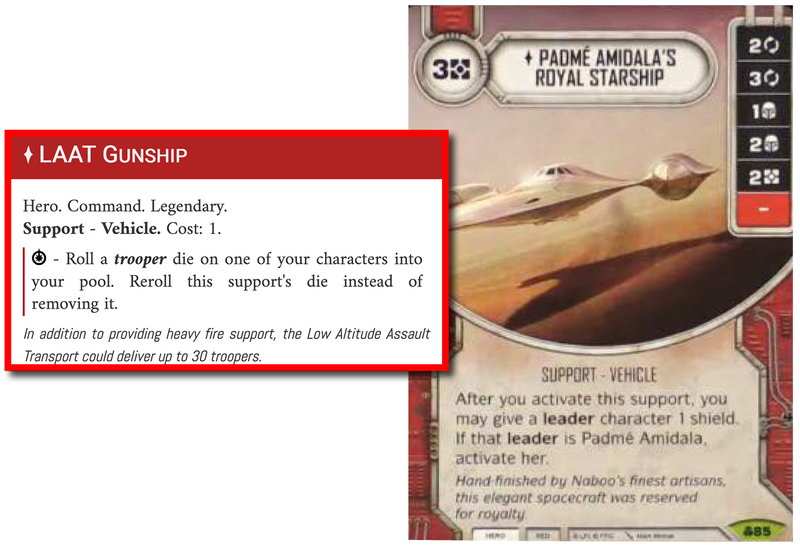 Without Padmé, it’s a solid Dooku’s Solar Sailer esque 3 cost support, and could see some play in decks with leaders. With Padmé, those juicy Focus sides also represent big Indirect potential, making this support tremendous. And don’t underestimate how valuable that Shield every round can be. It’s a high upside die for 2, but all those modifiers are painful. It never saw much play the first time around, but I will say my expectations are a little higher post rotation - modifiers are much more appealing in a post Force Illusion world. The Special is cute, but this card isn’t really doing much to forward your game plan. I guess the on play effect could make it valuable in a mill deck? 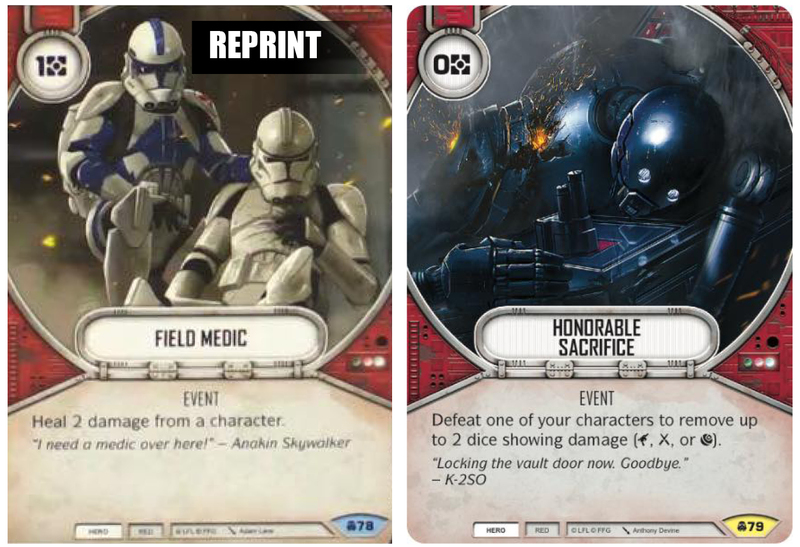 If Yoda is also included, you could use the special to recycle a card like Field Medic. Now that I think about it, this card could be a flex option in a mill deck. I don’t see this getting played anywhere else.